How many times have we all been heard to say the words, “I need new clubs!“? Probably once a round if you’re playing with some of my friends… so, should you change your equipment? And how do I go about selecting new golf clubs? Should you change your equipment? 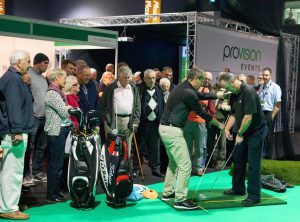 Fancy a new driver to boom those drives 300 yards? How about a new putter so you can putt like Speith? Your next question should be – will it really help my game? If the answer is ‘yes’ then great. An exciting time! But how do you make sure you get the correct equipment for your game? 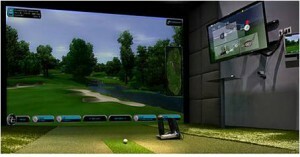 If you are looking for a new driver, the first thing is to get the correct loft. Way too many golfers I see do not have enough loft on their driver, this can affect their swing as they try desperately to get more height and distance. Such an issue this is, I have had a few golfers come in for a new driver, but with the help of a launch monitor, discovered they actually hit a 3 wood further. A couple of years ago Taylormade launched their mini driver with more loft to help with this issue. 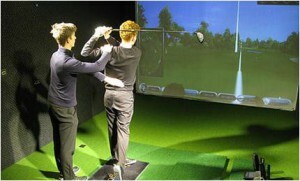 Selecting new golf clubs – What the correct loft is for you? 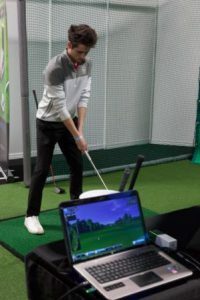 The simple answer is to have a custom fitting with a qualified golf Pro who has a launch monitor (be wary of American Golf as often their custom fitters are not Pro equipment and have much less knowledge). They will be able to tell you how high the ball launches, combined with how much you spin the ball to get the correct loft for you. You will be able to see yourself both the difference in results of launch and spin, along with (hopefully!) how much longer you now hit it! 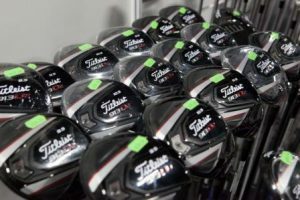 I’ve talked about a lack of loft here – just remember too much loft could mean shorter drives too (although in my experience this is less common). 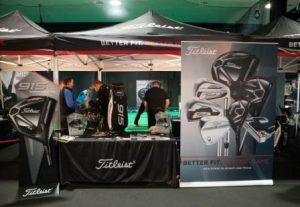 Shaft flex and length is important too – so if you are getting fitted the pro will advise on shaft flex and just make sure it ‘feels’ ok to you. I mentioned shaft length too – the average driver shaft off the shelf is 45”-45.5” long. The average driver length on the PGA Tour is 44”-44.5”. So why would us mere mortals think we can use a longer clubs than those experts! It’s only making things harder. Now, although a longer club can create more clubhead speed and therefore longer drives – it is much more important to strike the ball out the middle of the face for distance. Always try a shorter shaft (or grip down) to see how your results are affected. Those thin, shiny blades always look great in the bag. People will think “that guy’s good!” but if you proceed to shank one in the woods – they will be less than impressed! So what do the different head types do? Cavity back – This is more forgiving – the sweet spot of the club is made larger by cutting the back out the club and moving the weight around the perimeter of the club. There are differences in these though. Some have a big cavity on the back – the bigger the cavity the more forgiving the club will be. If it is only a small cavity, the club will not be quite so forgiving. Who should buy these? Essentially anyone. There are many Tour Players using cavity back irons now but it is important to buy the correct ones. Who should buy these? Anyone who struggles to strike the ball out the middle or hits the ball very low. Blades – Hardest of the club to hit. 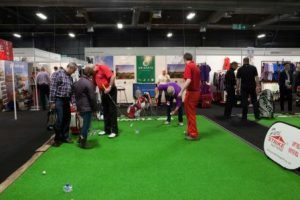 A small sweet spot and a slightly higher centre of gravity leads to shots that go lower but if you do not hit the sweet spot – do not expect to be hitting the green! 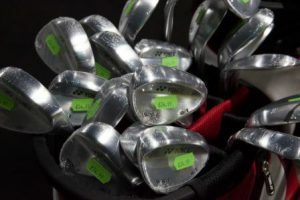 You may feel you fit into a few categories here but firstly make sure you are giving yourself as much forgiveness as possible – if the tour players use forgiving irons, why don’t you? Golf is hard enough, give yourself a chance! Next look at how high you are hitting the irons; for example, if you are trying out hybrids and striking them pretty well but they are going too high (possibly costing you distance), try a cavity back. This is all about getting the balance between forgiveness and hitting the ball on a good trajectory to give you the most distance possible. It is possible now to not have to have a full set with the same head type, you can mix and match. That is why you see golfers now having hybrids in the longer irons but there is no reason why you can’t go all the way down to say 6 iron in hybrids then cavity backs for the rest if it is going to make the game easier for you. 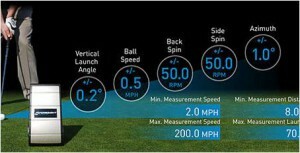 This may help you to find the blend between forgiveness and getting maximum distance. In order to determine the correct shaft and lie angle (which can have a massive effect on the direction of your shots) seek out a professional with a launch monitor to see the differences between shafts and lie angle. As a simple rule, if you want the ball to go higher and longer, try a more flexible shaft – not the most scientific approach but is a good rough guide! There are many styles of putter from blade to mallet. 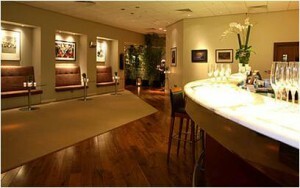 In my opinion, the most important thing to go for is a style you like the look of. Take this a little further and hit a few putts. I’ve found the putters I get on best with are a shape that allows me to “see” the line to the hole. By that I mean the design allows me to easily line the face with my target. What can be of importance is the shaft you choose. 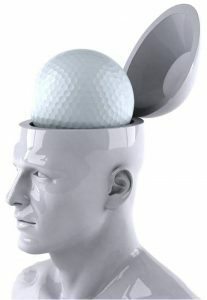 Now we are not talking about flex here but rather how the shaft goes into the head. Some go into the centre of the head, some go into the heel (as with other clubs), some go into the heel but have a kink near the end. But what is the purpose of these different shafts? Depending on the shaft you choose, the putter will be balanced differently from toe to heel. For example; a shaft that goes straight into the heel will mean the toe hangs down if held horizontal to the floor. (Picture). 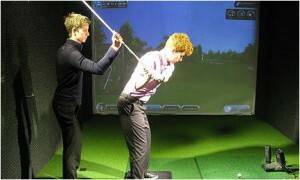 This will encourage the face to rotate open and closed through the putting stroke. Whereas a shaft that goes into the centre on the head, the putter face will remain flat. This encourages much less rotation of the face through the putting stroke. The same happens when you have a shaft that kinks into the head as if you were to continue the shaft line down to the head, ignoring the kink, the shaft would end up in the centre of the head. If you have a putting stroke that is rounded, i.e. the putter swings on an arc like a small semi-circle, then the clubface needs to rotate with that arc. 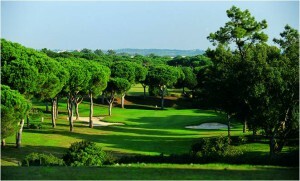 nd therefore you are best to choose a putter where the shaft goes straight into the heel. And therefore you are best to choose a putter where the shaft goes straight into the heel. If you have more of a “straight back and through” stroke, you want little rotation in the clubface, therefore a putter where the shaft goes straight into the centre or KINKS into the heel, will be better for you. It is best to get your pro to check what type of stroke you have (or get a friend to, if this is not an option). This is quite important as a lot of people think they putt ‘straight back and through’ but in fact have quite a large arc. So many golfers have a putter that is too big for them. The easiest way to find out is to set up as if you are hitting a putt, then let go of your putter and let your arms hang naturally. There should be a slight bend in your arms, but as long as they are hanging naturally and comfortable you will be on the right lines (picture). Then put your putter back in your hands and see how low (or high) on the grip your hands are. This is the length of putter you need. So there you have it, more great Pro Tips from Andy next month! Come Thursday, April 7th 2016 we’ll all be sitting down to watch the now infamous ceremonial tee shots of the US Masters 2016. 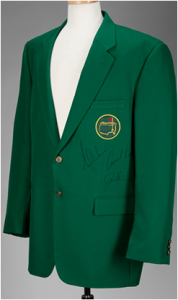 In 2015 Jack Nicklaus, Gary Player and Arnold Palmer kick-started one of the most remarkable performances from a young man Augusta National has ever seen. A man who has since projected himself to the top of the world, reaching peaks that can only be compared to the two most successful players in history; Tiger Woods and Jack Nicklaus. The new wonder kid of golf now has seven titles on the PGA Tour, and has finished in the top ten, 34 times in the past 3 years; let’s not forget he has only played in 79! That young man was Mr.Jordan Spieth. After winning by 4 shots last year we know that Spieth will be battling whoever decides to turn up for the first Major of the year with his best golf. However, the last few weeks, we have witnessed some issues with his swing, inconsistency and those putts have not been dropping. Therefore, Jordan Spieth, may not be passing the US Masters 2016 title and green jacket back to himself this April. One of the sport’s most loved players of all time has found his mojo! 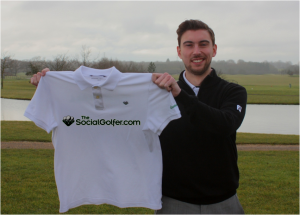 After ditching Butch Harmon in the autumn, Phil has hired a new swing coach in Andrew Getson. A fairly unknown character in the world of golf, Getson’s first few months have supplied big Phil with some superb results. Slumping to his lowest overall world golf ranking (OWR) since 1995 last year, Phil has already knocked up a 2nd, 3rd and 11th spot in just 4 starts this calendar year. 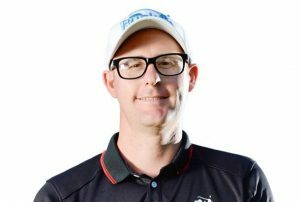 This 3 times masters champion chased Jordan to the end last season, finishing 2nd, and definitely has another major left! If the putts drop, Phil could easily bag himself a 4th green jacket. Once voted, ‘The most overrated golfer on tour’, this young heartthrob has found himself sitting just 3 spots away from the best player in the world. 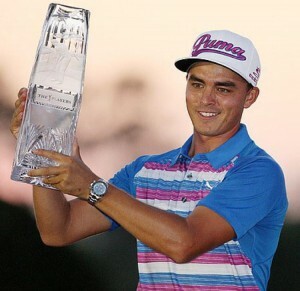 Not a bad year for Rickie with 4 victories including the Players Championship in 2015. Known for his eccentric clothing, he is now one of the most feared players on tour with an ‘incredible’ short game, just what Augusta asks for. T12th in 2015 and T5th in 2014 this guy knows what is needed here and could well find his first Major. Augusta could be Orange come April 10th. With one of the best swings on tour, one major in the bag and a solid start to the new season, Justin could be the man to follow around Augusta. In 10 appearances at The Masters, Justin has only finished outside the top 25 twice, including a tied 2nd place last year behind Jordan Spieth. A couple of poor putting performances have cost him a title or two this year however he has a few weeks to get this sorted. If you are looking at following a Brit, here’s your man! There you go, there’s the three tips for the US Masters 2016, Good luck!